3rd: Halladay, Marchant, Skinner, Holmes, Whatley, Brogden , A/P.O. Priestley , Kelly , Downey , Holt, Evans, Purchase , Rutter, Penny, P.O. Moore , Thorpe, L/S Barker, Schillemore, Carr, Hill, Charleson, Burrows, Rann, Deakin, Gavaghan, Moore. 2nd: Capt Macmillan, Supt Robinson, Sq-Ldr Oxford, Lt Pittendrigh, Lt Ashby, Lt Collingwood, Lt-Cmd Gandy, Cdr Montague, Adm Chan-Chak, Lt-Gen Wang Dafu , Lt-Gen Chen Qi, Lt-Cmd Yorath , Maj Goring, Capt Guest, Lt Parsons , Lt Kennedy. 1st: Bruce [Ships Dog], Sub-Lt Gee , Maj-Gen Fu , Mr Au Yeung, Coxswain Yeung Chuen, Lt-Cmd Hsu Heng (Henry), Maj-Gen Tung, Sub-Lt Legge , Sub-Lt Brewer . The White Ensign had been saved from the scuttling and was draped alongside the Chinese Nationalist flag. The escape party left Aberdeen in HMS Cornflower's launch down Aberdeen South channel where they were shot up by the Japanese from Pill Box 12 and Brick Hill. 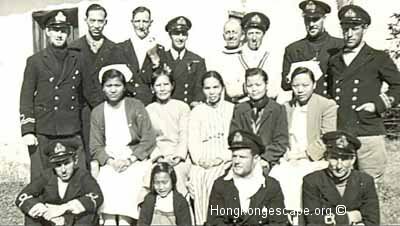 Colonel Yee Shiu Kee could not swim and stayed on the launch along with the badly wounded Captain Damgaard. Both survived after spending the night drifting in the launch. Yee Shiu Kee escaped with the help of local fishermen to China. Damgaard, whowas shot through both legs survived the war. Forster JJ. and D Harley [2nd Engineer SS Yatshing] were both shot and killed. Burrows Alfred J: Acting P.O. Coxswain [ C/SSX19415 ] (Ipswich Suffolk) Replaced Act PO Robert Spirit [ JX131484 ] wounded in action on 19th December. Kendall Francis W [Mike] Head of Recce Unit H.K.V.D.C. C.B.E. Yee Shiu Kee; Colonel CPA. M.B.E. McEwan Colin M; S.O.E. O.B.E. 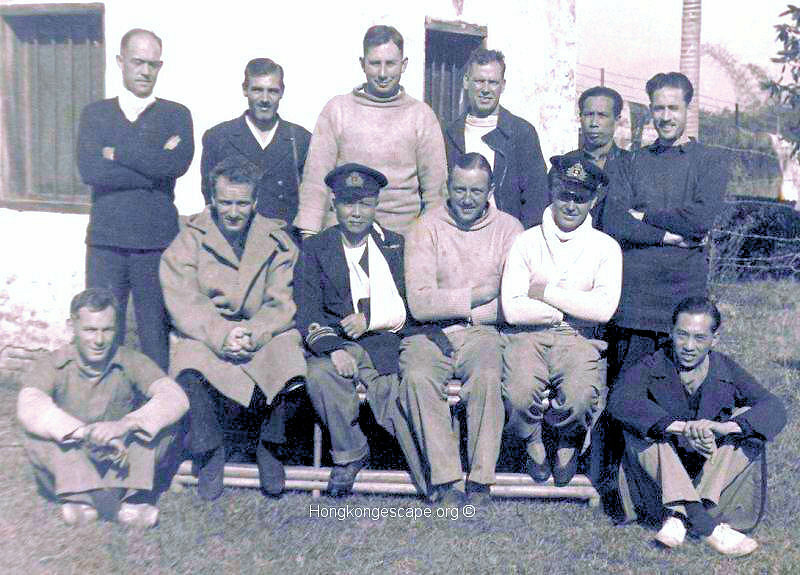 Montague Hugh Monthermer; Cdr R. N. (Retd) Hsu Henry Heng; Lt-Cmd ROC. D.S.C. Ashby Ronald Robert Wilson; Lt H.K.R.N.V.R. Wright William Morley; Warrant-Officer H.K.R.N.V.R. Montague Hugh Monthermer; Cdr R. N. Retd. Gandy Gerard Horace; Lt-Cmd R. N. Retd. Collingwood Cuthbert John; Lt R. N.
Prest John William; Petty Officer R. N. P/JX128494. Hide Stephen John; Petty Officer R. N. P/KX82873. Priestley Ronald John Charles; Petty Officer R. N. P/KX81900. Schillemore William Arthur; Leading Seaman R. N. P/JX142194. 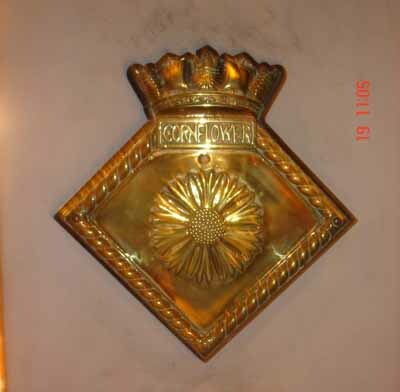 Christensen Holger; Cadet M. N.
Click here to apply for service records of family member's.